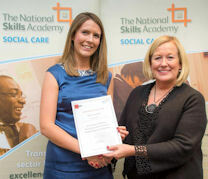 Lizzie Comley, who is completing a years placement at ADASS, recently received her ILM Level 4 Management and Leadership qualification from the National Skills Academy. Her placement at ADASS was part of the NSAs Graduate Management Training Scheme*. During her year with ADASS Lizzie contributed to a variety of work including arrangements for the annual Spring Seminar and the SCIE/ADASS White Paper Seminar; policy consultations; a Telecare project in Greenwich; mapping ADASS work streams and partners, and also the day-to-day running of the Business Unit. In addition to this, she has worked to complete her ILM and her Prince2 qualification. She will move on in January to PA Consulting to join their Local Government team. But will spend her first 15 months seconded out to the London Joint Improvement Partnership. Lizzie said Beginning a career in the sector with little to no previous experience of social care is no easy task. However, a year at ADASS has proved a great start enabling me to develop an understanding of the current policy landscape; to hear about, first hand, the challenges that are facing the sector; and to learn about the ways in which managers and leaders are facing those problems. I would like to thank all of my colleagues in the ADASS Business Unit for making this year as beneficial as possible and in particular, Jonathan Gardam as my supervisor. In addition to this, I would like to thank the National Skills Academy for giving me the chance to pursue this career, the staff there and particularly the supervisers with whom I studied on a regular basis. They were simply terrific. The DASSs who have invited me to shadow or work with them over the past 12 months have also been enormously helpful. These include Richard Webb who kindly agreed to mentor me throughout my placement and also John Nawrockyi for providing me with the opportunity to work on a project in Greenwich. I am sure the knowledge and skills I have gained over the past 12 months will prove invaluable in my future career. The picture shows Lizzie Comley receiving her award from Jo Cleary, Chair of the NSA. The National Skills Academy for Social Care is intended to meet the needs of social care practically, stimulate new thinking in social care in support of realising personalisation, and help improve its perceived status. It provides a year of management and leadership experience for graduates in order to develop the management skills necessary to become a successful leader in the field. In 2012, just under 1,000 people applied for 20 places available. Minimum requirement is a degree in any subject, minimum 2:2 classification or equivalent. Applicants undergo a robust recruitment process, and we hope to increase the number of applicants for future cohorts. NSA has recruited a fourth cohort of trainees, to start on January 21 2013.